All deaths in war are tragic, but there seems a deeper melancholy with a death very close to the end of the conflict, and with a child being left an orphan. After fighting in the successful assault on the Hindenberg outpost-line, the 9th Australian Infantry Battalion went to a well earned rest in Gorenflos, France on 26 September 1918. In Gorenflos the men erected a cinema and battalion baths, and relished the opportunity to play football and other sports. The officers were invited to play tennis at the local chateau. It was at this time that Captain Frederick (‘Fred’) Donaldson of the 9th contracted influenza and was sent to No.2 Stationary Hospital in Abbeville on 17 October. His illness became acute and he died there on 23 October 1918. Nineteen days later the Armistice came into effect on 11 November 1918. Fred had endured the passing of his wife Mary Ingram (nee Sutherland) from a tumour on 10 May 1913 in Rockhampton, and then the death from diphtheria of his 11 years old son, George Frederick on 17 August 1917. With Fred’s passing, his eight years old daughter Mary Isabel (‘Belle’) was left an orphan. Fred was born in Petrie Terrace, Brisbane on 18 May 1881 into the large family of his Irish parents, drayman John and Isabella (nee Carruthers) Donaldson. He attended the State School in Petrie Terrace and the Technical College in Brisbane, and then worked as a commission and insurance agent.In 1900 he started what would be lengthy service in the part-time militia, with two years in the Brisbane company of submarine miners. Later he moved to Rockhampton and it was there that his two children were born and he became local manager of the Royal Insurance Co. Outside of work Fred continued to be active in the militia, being promoted to 2nd Lieutenant in the 15th Australian Light Horse in 1906, and Lieutenant in 1909. Next he was a Lieutenant in the 1st Light Horse (Central Queensland), as the officer-in-charge of machine guns. When he enlisted in the AIF on 24 March 1916 Fred was placed with the 3rd Divisional Cyclist Company as a Lieutenant. He embarked in Sydney on the Demosthenes, arriving in the UK on 20 July 1916. The disbandment of the 3rd Cyclist Company led to Fred’s transfer to the 9th Infantry Battalion in September 1916 and he proceeded to France with reinforcements and arrived at the 9th Battalion’s position on the Somme on 4 December 1916. Fred was recommended for a bravery award for his actions on 24-26 February 1917 near Le Barque, France. The recommendation says that he ‘displayed great bravery, skill and initiative. His brilliant example inspired all ranks under his command. At one period of the engagement when leading a carrying party to the forward line he came under extremely heavy artillery and M.G. fire. Notwithstanding this fact he displayed the greatest determination and led his party through the barrage and to the front line with the minimum of casualties’. No award was given – whether others at the time were more deserving, or an unspoken quota had been reached, is not possible to ascertain. However, we do know that he did not lack courage or leadership skills. Fred had extended periods as a trainer after March 1917 with the 69th Battalion, the Overseas Training Brigade and the 3rd Training Battalion. He was promoted to Captain on 1 October 1917. Returning to France in December 1917, Fred rejoined the 9th Infantry Battalion in the Messines sector. The German Army launched a major offensive in March 1918 and the 9th played a part in bringing it to a halt. Fred then suffered a dislocated left knee in May 1918 and spent a period in the UK to recover. Fred returned to the 9th Battalion on 9 September 1918, in time for the successful attack on the Hindenberg outpost-line. It was from there that the Battalion moved back to Gorenflos. There was a worldwide epidemic of influenza in 1918 and 1919 – more died around the globe than in the War itself – and in Gorenflos it claimed Fred Donaldson. 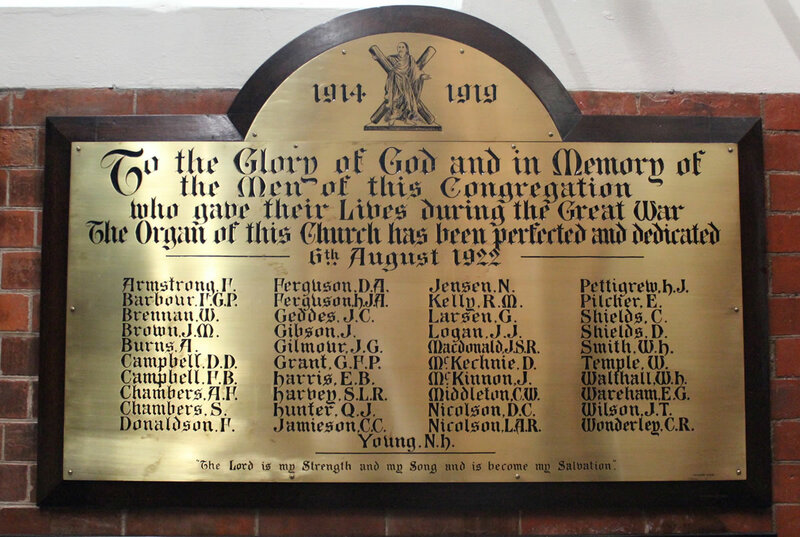 Chaplain Major S. MacBain wrote to Fred’s brother William that Fred had been quite well, then a little ‘out of sorts’, but became acutely ill quite suddenly. The Chaplain went on to say that ‘One hears much regret expressed at the loss of so good a man whose quiet demeanour and conscientious performance had endeared him to many’. Fred was buried in the Abbeville Communal Cemetery Extension – in Plot four, Row J, Grave six. His wife Mary had been interred in the Rockhampton cemetery and son George in the Toowong cemetery in Brisbane. All a long way apart. Will scatter some flowers for me. There were also poignant notices from some of Fred’s siblings in 1919 and 1920, and a notice about young George Donaldson in 1920. 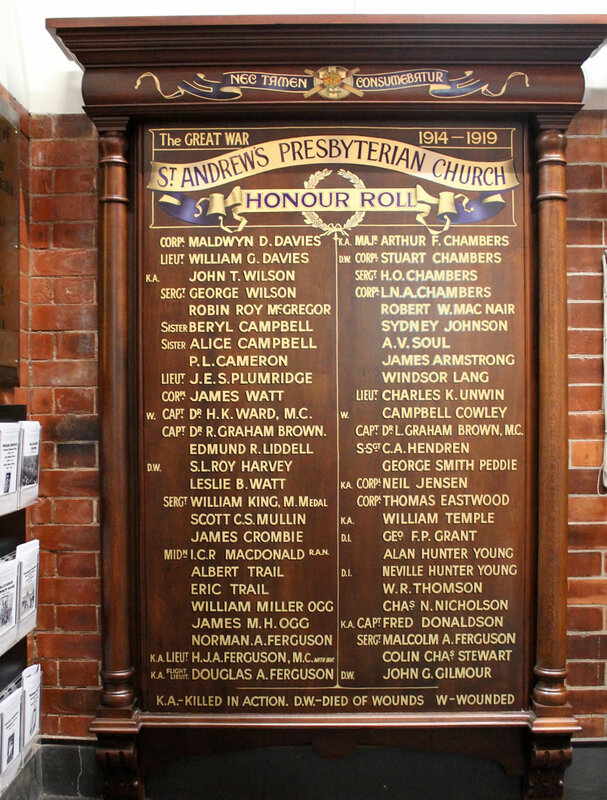 Fred’s sister Annie was a member of the congregation of Saint Andrew’s Church, Ann Street, Brisbane and he was included on one of the Honour Boards in the Church. Daughter Belle's guardian was her maternal grandmother in Brisbane - Mary Anne (nee Mackay) Sutherland - and the Repatriation Commission paid an orphan's pension and later a bursary. Belle was an impressive domestic science student at the Central Technical College from October 1923 but her bursary was cancelled in June 1925 because her grandmother's care needs (Mary Anne had become an invalid) were interfering too much with Belle's attendance - the College Principal angrily wrote that 'I consider the girl's future is being sacrificed'. In 1927 a Sutherland aunt took Belle, as well as Mary Anne, to Adgingbong Station, Cunnamulla, and Belle attended the Presbyterian Girls College in Toowoomba. Then in March 1932 Belle married Bruce, the third son of grazier James Kerry Parkinson and his wife Isabel Anne (nee Hellmann), of Yerral Station, Wyandra in south-western Queensland. The extended Parkinson family became a prominent and well respected one in the Queensland pastoral industry. Belle – who lived to the age of 96 - was a warm, much loved and down-to-earth person, and she and Bruce had a son and a daughter. • State Library of Queensland, Photograph of Spreydon College now Fairholme College, Toowoomba.